Created with the purest ingredients possible and nothing artificial. SkinFood’s subtle, inviting scent of chocolate and coconut comes naturally from its materials. Blended with all edible oils that are loaded with vitamin E and essential fatty acids for healing and moisturizing. Never greasy or sticky but always velvety-soft and thoroughly absorbable, SkinFood is a perfect all-over-body daily moisturizer. 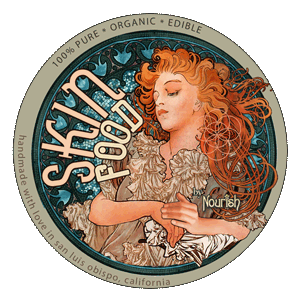 goddess tip: SkinFood is my favorite all-over body moisturizer. Just smelling dark chocolate releases endorphins into our bodies! SkinFood makes an excellent partner massage cream, so spread some love and endorphins with your next massage.